Perhaps, few other places can claim to be as enchanting and friendly as Leh. Its diverse landscape presents abundant opportunities for adventurous activities like water rafting, mountain climbing, safaris etc. No wonder, this fabulous place witnesses a large number of tourists throughout the year. This “Land of Passes,” with its beautiful valley, jagged mountains, magical passes and quaint villages, is also the ultimate trekking destination. The numerous trekking trails here bring you face to face with surreal landscapes, while letting you experience an adrenaline rush like never before. 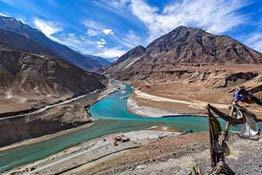 However, to get a memorable experience, here are five treks in Leh Ladakh that is perfect for any trekking enthusiasts. During sub-zero temperatures during winters, the Zanskar river transforms into a sheet of frozen ice. 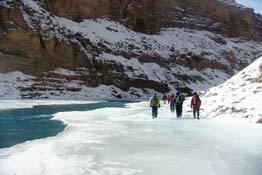 The trekking opportunity presented by it is called the Chadar frozen river trek. 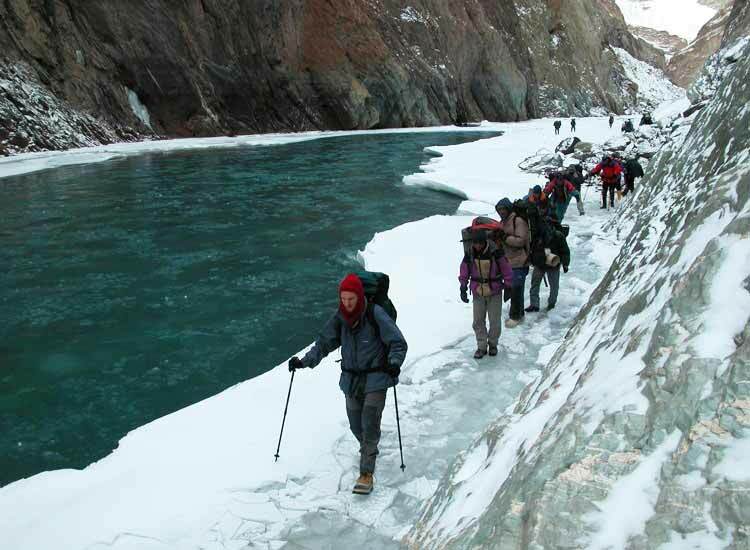 The route covered by this trek connects villages in the Zanskar Valley with Chilling along the frozen Zanskar River. Walking over the lake, one gets the feeling of one’s feet sliding over the icy ground. The immediate surrounding sights like frozen streams and icy glaciers, really has a captivating effect on the mind. Although most of the trekking here is done on a frozen riverbed, there are points when one is required to scale icy rocks as well. One of the most popular trekking routes of Ladakh is the Stok Kangri Trek, and is a favorite with professional trekkers. With an altitude extending beyond 6000m, one does require professional expertise to undertake such a difficult trek. The entire route is accompanied by complete tranquility, as most of the surroundings are completely deserted. 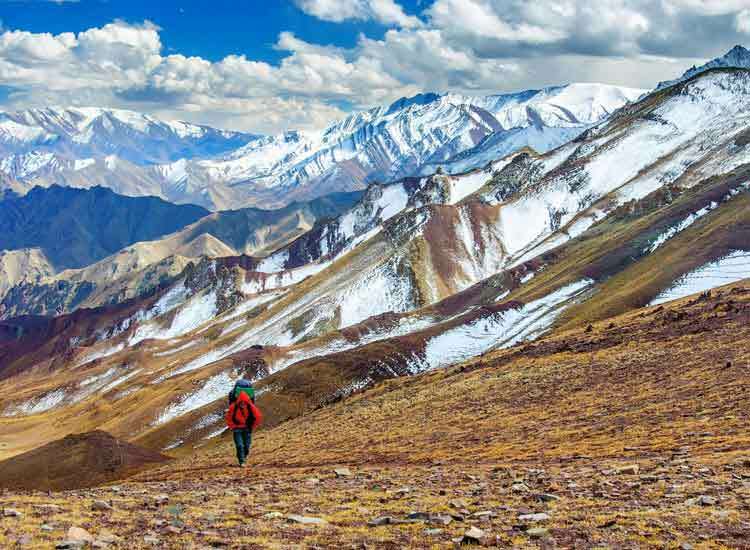 The peaks and glaciers enveloping the Stok Kangri Trek provide breathtaking views to the trekker. The route to the top is as adventurous as it is beautiful. From the Stok Kangri peak, one is able to get astounding views of the Karakoram Range to the North and the Zanskar Range to the South. 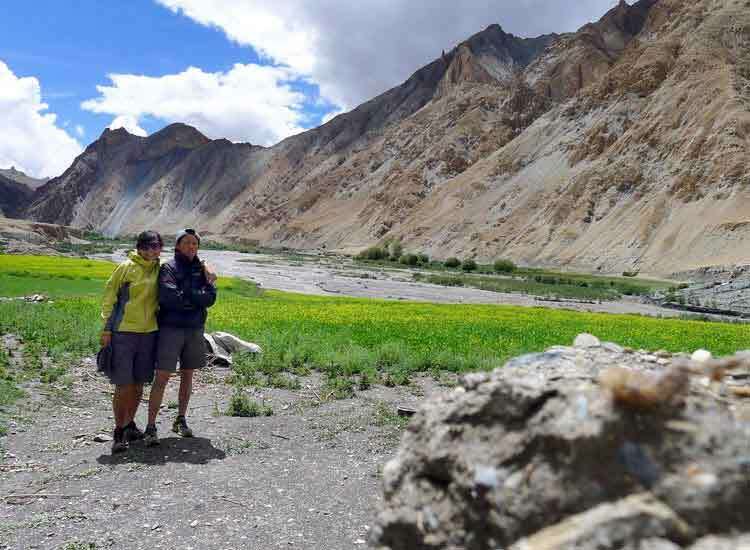 Markha Valley Trek presents the contrasting colors of nature to the individual trekking its amazing terrain, and is counted amongst the famous trekking destinations in Ladakh. This trek is also known as “tea house trek” due to the accommodations which are available in parachute tents at most of the village’s enroute. All through the way, one is treated to the sight of marvelous landscapes, green oasis, quaint villages, monasteries and the stunning Kongmaru La pass, located at 5000m above sea level. 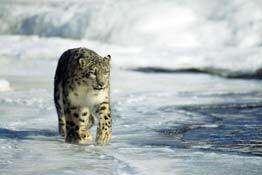 One can find The Hemis National Park situated in this region, which is renowned for its amazing biodiversity. When it comes to the famous trekking routes in Ladakh Valley, none can beat the Lamayuru to Darcha Trek. 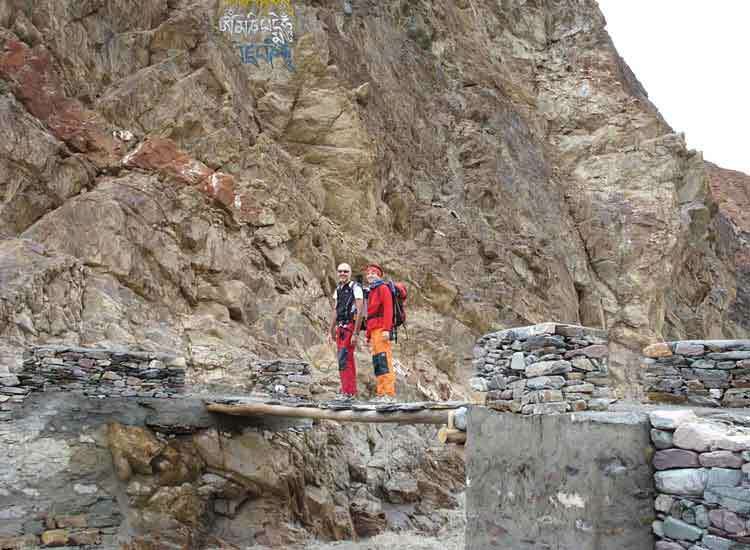 This trek, which establishes a connectivity with the Zanskar Valley, has endeared itself to numerous trekkers around the globe due to its incredible terrain. 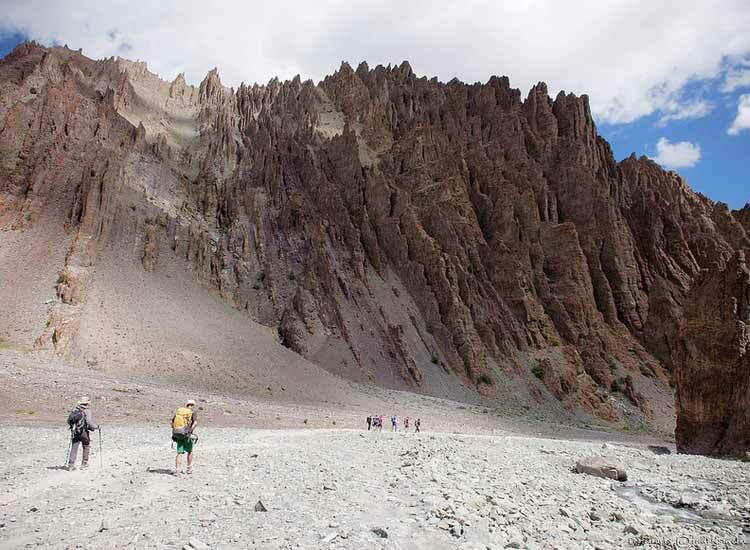 This trek commences from Lamayuru, home to some of the oldest monasteries in Ladakh, and makes its way through amazing passes, quaint villages and silent valleys. Further, during the course of this trek, one also witnesses heavenly views of the Stok and Karakoram ranges. Ripchar Valley Trek, considered to be one of the most scenic trekking routes in Ladakh, commences near the Lamayuru monastery. 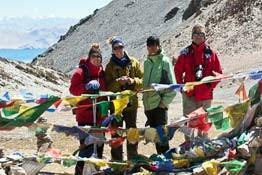 This is a brilliantly planned trek which provides useful insight into the Ladakhi way of life. Beautiful rolling pastures, quiet villages and irrigated fields of the Zanskar and Karakoram Range – these are some marvelous sights offered along the way. During the months of July and August, the entire region is carpeted by flowers, thereby becoming a haven for nature lovers. The trek comes to an end in the region of Chilling, an impressively large village, and the only one of its kind to deal in metal works such as bronze, copper etc. Through this blog, we have acquainted you with all the necessary information related to the various trekking routes in Leh Ladakh like altitude, best time to visit, difficulty level etc. You can opt for any particular trek depending on your stamina, physical fitness and any other requirements. We have number of trekking tours to Ladakh that you can visit and book with us. 2 comments on "Five Famous Treks in Leh Ladakh – Perfect for Trekking Enthusiasts!!" Amazing post, I will follow you. Keep up the good work!! Thank you for showing interest in our blog. We really appreciate your comments. 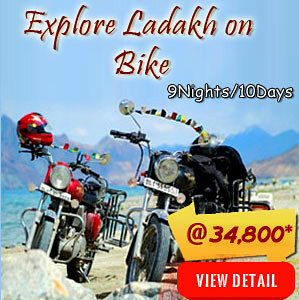 Yes, Ladakh is a marvelous place worth visiting the year round. Please let us know if you have any queries related to trekking trip to Ladakh. We will be happy to provide you the full details.